Discussion in 'iPad General Discussions' started by AbblePC, Feb 21, 2010. "Thatâ€™s not because of slow mobile performance, battery drain or crashes. Itâ€™s because of the hover or mouseover problem." This from the perspective of a FLASH developer. Which is funny because HTML5 and iPhone interations suffer the same thing and it looks like various developers in that sphere are already looking at ways to use the touch APIs to deal with that. Seems like the key will be length of time the finger is stationary to decide hover vs click. And that seems like some Adobe could add to the flash player itself as a default when it detects the proper moblie touch browser. It could even be handled the same way it is in Jaadu VNC in mouse mode (one one finger quick double tap becomes mouse click, two finger tap right click. Then again the mouse is already on the screen. Still again something Adobe would need to add at the Flash Player level as a default interation when passing those inputs to the flash content. The iPad is going to make people think sideways about user interaction with programs, more so then the iPod/iPhone. No, the reall problem will be mouse plus keyboard interaction. Wasd for movement is shot without an exteral keyboard. And thier is no good base level work around for that. It's nice to see a rational, logical discussion of this from someone who has a clue instead of angry rants on why flash is evil or walks on water. Sorry I was a little disjointed early this morning. That was a very nice blog post and cut closet to real techincal issues not just with the iPad but with all touch based tablets. While I'm not back up to speed with HTML5 the way I should be just looking around at various Canvas examples on the iPod the problem becomes clear. However I can see ways to adress the mouse problem. Unfortunatly it would require several fixes form Apple, Adobe, or both. The first would be to lock scrolling or change it to something like a 4 to 8 finger gesture for that page while there are touch events inside the canvas/flash-embed area. Then for FlashPlayer it needs to read different touch input and pass it as normal mouse events (however Adobe wants to bind them by default). It would also have to disable the hover Copy/Paste pop-up as well. The bigger issue then touch as mouse is the lack of keyboard. Any device that uses a touch based on screen keyboard is going to have problems. You either cut down the screen space or need an external keyboard. For Flash games this will be a nightmare. And not limited to the iPad (if it had flash). Take a look at the difference between PurpleFloyd's platform implentations of PC and iPhone. There wouldn't be a good way adding extra keys to the Flash program after the fact from FlashPlayer as touchable replacements for keyboard input. I'm Bumping this mainly for the reason to help curb the attention the "Why No Flash..." Thread is getting, when really its more DRM related than Flash related. It's more of a technical issue, not a personal one, that Apple chooses not to support Flash. Reading this article explains most if not all of the reasons why Flash is not supported on the iPhone OS. There's a nice rebuttal to this app but I'm too lazy to look it up. Flash COULD be on the iPad, Adobe developed the iPhone version already. It's being kept off the iPad. I'm not one who think's that's a "deal breaker" -- but I'm not going to say I wouldn't _like_ to have the choice of running flash on my iPad. 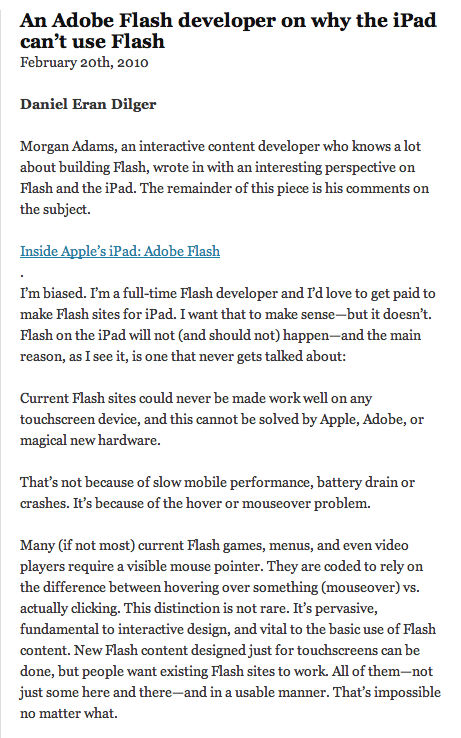 I don't really buy the premise that Flash can't be implemented on iPad merely because of some user interface details. Most smartphones will be going to some form of touch interface in the next year, if they haven't already. Adobe wouldn't have announced their latest Flash Player 10.1 and Adobe AIR at Mobile World Congress if the touch interface couldn't be used in some way. See Adobe Announcements at Mobile World Congress 2010 (Adobe Featured Blogs) for copies of the announcements. The Flash developer even proposed the logical solution to the problem: Touch replaces mouse-over, and tap or double-tap replaces mouse click selection. Then after proposing it, he dismisses as unworkable because he somehow thinks its too complicated. Oh, please. . . The problem really is Flash performance on the Mac, and by extension, to the iPhone OS, which, as Tim Cook pointed out, is merely a version of Mac OS. As a dues paying member of the iPhone Developer Program, I can attest to this often misunderstood fact. So poor Flash performance in Mac OS translates into even worse performance in iPhone OS, given the very limited processor resources available in the Samsung chip. It is certainly open to question, who's to blame, Adobe or Mac OS for the poor performance. I prefer not to speculate on this. The solution is still the same either way: Apple and Adobe need to collaborate on an efficient version of Flash for Mac OS.